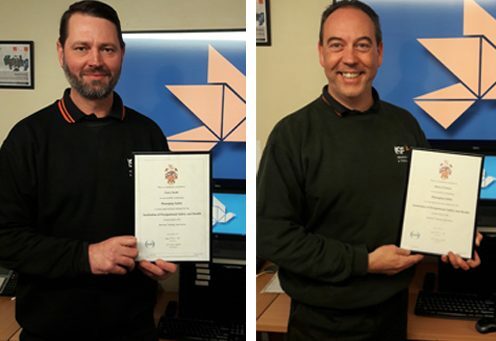 Our Site Engineer, Gary Scott and Project Manager, Steve Cruwys, recently passed their Institute of Occupational safety and Health (IOSH) Managing Safety course. This is a five-day intensive course designed to help managers and supervisors to understand their safety and health responsibilities when managing projects. More than 50% of ISF employees now hold the qualification which demonstrates the company’s commitment to health and safety and a culture of safety awareness and appreciation. Managing safely includes identifying risk and managing safety for whole projects from the planning stage through the design and installation process.